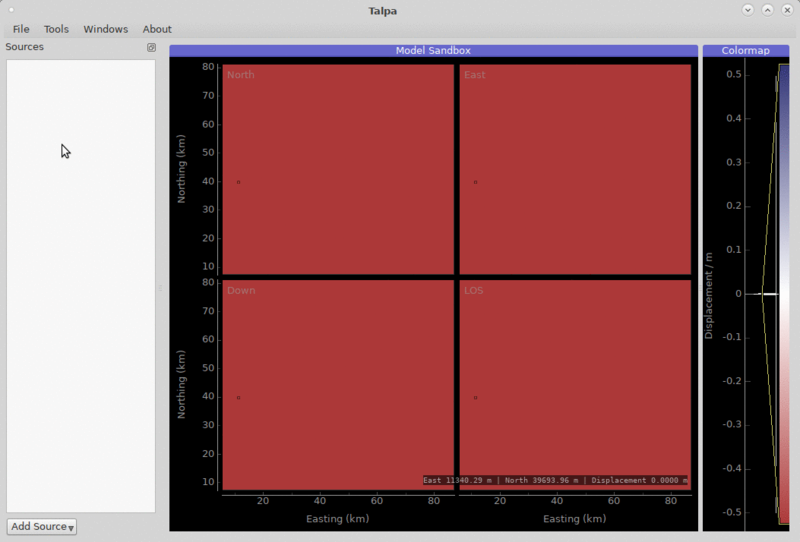 The tool talpa ( Talpidae; the mole ) enables interactive modelling of static displacement sources. It acts as a front end for kite.SandboxScene, a modelling sandbox for InSAR scenes. Examples for a programmatic interaction with the sandbox can be found /examples/05-sandbox. A basic analytical displacement source is OkadaSource. We will use an Okada source in examples below, however the other’s sources handling is similar. Implemented source types - Point sources and extended. for more information see http://www.volcanodeformation.com and . Nikkhoo, M., Walter, T. R., Lundgren, P. R., Prats-Iraola, P. (2017): Compound dislocation models (CDMs) for volcano deformation analyses. - Geophysical Journal International, 208, 2, p. 877-894. A selection of different displacement sources can be added to the modelling sandbox by right clicking on the source list. Adding a source to the kite.SandboxScene using the GUI. The spatial parameters of the the sandbox’s source can be interacted with by click-and-drag. Advanced parameters, in this case dip, rake and slip are accesses through the editing dialog. Interactive manipulation of a OkadaSource within the sandbox. Parametrisation through the source’s editing dialog (<right-click> ‣ Edit). 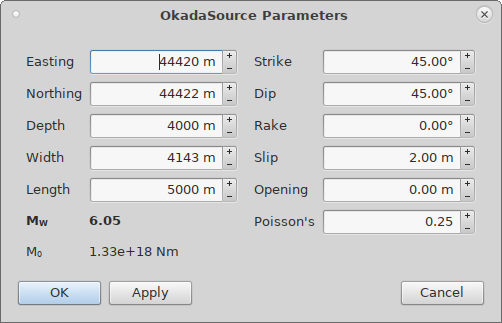 Source parameter dialog for an OkadaSource. The scene can be saved and loaded through the File menu. © Copyright 2018 The kite developers.